When you found me I was broken. My world was a mess and I no longer cared if I lived or died. I lived my life with a reckless abandon, disregarding the consequences, if I didn't make it to see tomorrow it would have been fine. The night that I met you was like every other night that I spent out, waiting for trouble, hoping that this would be the last night. We started talking and I felt something change in myself, for the first time in a long time I was excited, excited to see your name pop up on my phone, butterflies fluttering through my entire body at the thought of you stopping by on your way home from work. Laying with you was like walking on clouds, your touch like raindrops on my bare skin. At the time our relationship was purely physical, and it was. Perfect. As the weeks went on, I found myself craving your time, even just one word on the days I knew we wouldn't see each other, just one picture of your day. My heart started changing in these weeks. You became so important to me and I felt that maybe if I was lucky you'd feel the same about me. The night that you told me you loved me, I had changed so much. 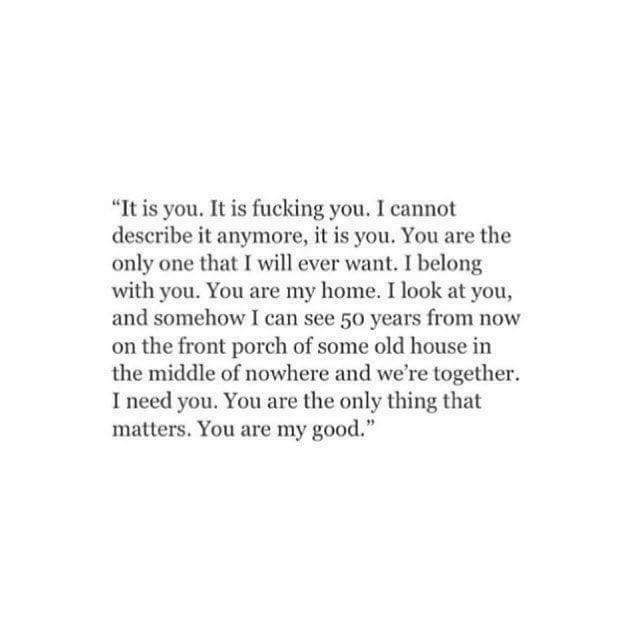 Those three little words engulfed me and transformed me. You left that night and I was almost high on the euphoric feeling. The days and weeks that followed can only be described as magical, every moment filled with awe and wonder, I could not believe that you had fallen in love with me, this broken crazy mess of a person. But you did. I know I questioned you alot. Asked you too many times if you really loved me, but with patience in your eyes and loving arms wrapped around me you always said "I promise that I love you, always." You left. All of a sudden almost overnight you decided to end our relationship. You still told me you loved me but refused to talk to me. The minuet I saw you again it was like we never stopped being us but the minuet I left again I knew. Somehow, somewhere, I lost you. I was devastated, broke all over again. How could this happen? What went wrong? Why didn't I see it comming? How do you stop being in love with some that you swore you'd love forever? I still have so many questions and so many things I know I'll never say to you. I cry less now, but I still cry. My days are back to being empty. In the time that you loved me, I learned to love myself, and now I don't know if I remember how to do that anymore. It's agonizing to not message you Everytime I think about you. But I'm trying not to. If you miss me you will text me right? And if you don't I know a little bit more of me will die. I don't know how to let you go. I don't know how to stop loving you. I'm trying to figure it out I really am but it's just not working for me. I know that you may never love me again, and I know we may never get back together. But a piece of me is holding on to that. A piece of me believes that we will find our way back. And that's what keeps me going. I still love you, and I'm still in love with you, I didn't plan it I never thought we would become us, but I'm so so great full that we did.